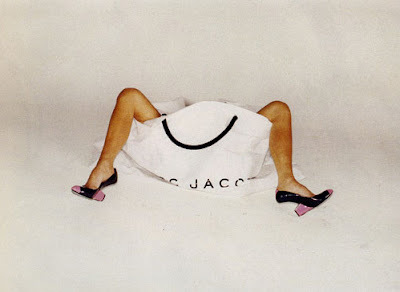 Marc Jacobs Spring 2008 collection has risen to new levels with a new ad campaign featuring Victoria Beckham, aka Posh Spice. Ever wonder how small she really is? Now you know. I think this is a brilliant ad, though. It features a celebrity while bringing to light to designer through small glimpses of Marc Jacobs collection strategically placed on her. My favorite is the one below on the left. Everyone's talking about it- which is exactly the point of advertising. Someone deserves a raise.